Well school is finished for this term but it was with great pleasure that I was able to take a packed car full of food and treats to the Salvation Army on the last day of term. Students had taken up the challenge and produced some quite amazing Reverse Advent Calendars. One involved a chimney and Santa's feet protruding and inside two layers with 48 gifts, including choclate, soft drinks and basic foods. Others were just boxes filled with food and chocolate, or in the case of my tutor group chocolate, chocolate and chocolate! What really touched me where two boys who won selection boxes for something they had done this term, they were presented with them in an achievement assembly and both gave them to me to take with the Advent Calendars. Sometimes we judge our young people by what we see on the streets or hear on the news, but let's rejoice that there are so many young people who are prepared to give as well as take so that others can benefit at this special time of year. When we are so taken up with getting ready for Christmas and wrapping presents, decorating the tree and buying or making food remember that some people are not as fortunate as we are. That a simple act of kindness can cause ripples which can have a massive impact. This year I have seen a number of postings on Facebook about "A Reverse Advent Calendar". What you do is build your own Advent Box - 'Add to Advent'. Instead of taking chocolate 'out' of a calendar you put one item of non-perishable food 'in' a box each day. At Christmas the full box can go to the Foodbank as they try to ensure no one goes hungry this Christmas. I started to do it and at the side also have another box to which I am adding a chocolate treat - everyone needs something a little special especially at Christmas. I decdied that it was something I could challenge some of the students to do at school as well - if each person in the tutor group brings something we have a full box which we can then take to the Foodbank and help people in our community. So in my Assembly on Friday that's what I did to the Sixth Form and knowing them I feel pretty sure they will respond in a very positive way. Next week I have three Assemblies with the younger students and I shall give them the same challenge. School is not just about thinking inwardly it's about being fully part of our community. So hopefully people will see that we care. How is Advent impacting you this year? Is it just the rush and pressure of getting ready for Christmas or is it a time of reflection on the coming of our Saviour and what He might He want us to do at Advent? Perhaps we just need to stop a moment and think how we can make a diffence. November is a month for remembering. All around us people are wearing poppies, a symbol that we remember the lives of those lost in war. The Christian faith has a strong tradition of remembering. As Jesus approached his own death we’re told that he shared a simple meal with his friends. He urged them to remember him every time they break bread or drink together. He knew that he was going to die but he wanted his friends to know that he would never leave them. Jesus invited his friends to remember him every time they ate bread or drank wine – an act of remembrance associated with life and all that lies ahead, not simply what lies behind us. Sometimes the act of remembering will trip us up as we seem to forget what has happened, at other times the act of remembering is our greatest comfort and strength. When we lose someone dear to us, it’s as though a jigsaw puzzle has been thrown up into the air and all the pieces have been scattered far and wide. As we remember, the pieces start to come together – only the picture isn’t quite the same. We have to look closely at what is emerging, but there, in the new picture, is the possibility that we can still love the one we have lost and that the life we did share with them has made a difference to the people we are now. I am convinced that neither death, nor life, nor angels, nor rulers, nor things present, nor things to come, nor powers, nor height, nor depth, nor anything else in all creation, will be able to separate us from the love of God in Christ Jesus our Lord. It takes courage to remember. Take courage from Paul’s words that absolutely nothing, not even our grief, can separate up from the love that we have shared with those we have lost – love is stronger than death and love is of God. Last week I returned from just over five weeks in my oasis in Canada. It was so good to leave my life here in North Devon behind and have time to relax, read. meet up with old and new friends and recharge my batteries. As the end of the school year draws closer I feel like I am running on empty and it becomes harder to feel like you are giving fresh bread to the congregation when you preach. Well that is what I feel it might not be true for others. I think having two very demanding roles takes it out of you. So the opportunity to totally switch off is very welcome. Not having a routine of early mornings and having to be at meetings. Not having to write sermons, prepare resources and teach lessons all those disappear when I am away. They will soar on wings like eagles; they will run and not grow weary, they will walk and not be faint." And those verse are so true when we spend time with the Lord and wait on Him he gives us new strength. We don't need to be on holiday, it is true all the time, it is just that being on holiday seems to create the time that I want and need to be with God. Even before I go away I know that if I can find time for God He will meet my need it's just all the other things that get in the way. So I am back home, I have already taken and preached at three services on my first Sunday back and tomorrow school starts. Yet I feel ready, having had that time to wait on God and spend quality time with him. My challenge in the coming months is to continue to go to God and allow Him to renew me, to make my time with Him a priority so that I can serve Him as He deserves. I know that many of you now will be looking at the title of this post and wondering what it means! I didn't know till a few days ago when I was trying to write my sermon for Sunday and was struggling to get a grasp of where I was going with it. The Lectionary reading is Mark 5:21-43, which contains two famous stories of healing. One is the raising of Jairus' daughter, the other the women with a bleed which she has had for 12 years. I was struggling to make some connections with the accounts which was a bit "different" and started to read a book which said rather than thinking of the words "Talitha Koum" which were in Aramaic to think of the Greek word "Egerio"
Talitha Kum. "Little girl, get up. This is one of the few phrases which remain in Jesus’ native tongue of Aramaic, as if saying these words in the original language hold power and truth and healing in and of themselves. Egeiro - means get up and is used in each of the four gospels to refer to Jesus' resurrection. So this had me thinking about a different sort of thread in the stories about resurrection. I guess it made me think that you and I are like both Jairus' daughter and the women with the bleed because in a biblical manner of speaking we are dying. What the end of Mark 5 is saying is that each one of us is having the life drained out of us one way or another by the different things we struggle with. That is until we encounter Jesus. Either we reach out and touch Him or He touches us, and then and only then do we receive the real gift of life. Every year Giles seems to be away when Trinity Sunday comes. If you read the June 2015 Mission Community Magazine (http://holytrinityandstpeters.2day.uk/section/TheMissionCommunityMagazine) he does say that and then gives a few hints as to what he thinks about the Trinity. So once again I have to preach on this particular Sunday, which is fine except I almost always want to say the same thing! It is the only festival of the church that celebrates a doctrine – a humanly created statement about the nature of God. The doctrine of the trinity emerged slowly across the history of the church, referenced but never fully defined in scripture. It is a human attempt to describe our experience of something that we acknowledge is beyond our ability to describe. It says that God’s essence is relational, that while the God we worship is absolutely One God, we experience that God in relationship to three persons – God the Father and Creator, Jesus, the Son who heals and redeems, and the Holy Spirit, who enlivens and transforms. The doctrine of the Trinity teaches us that the central characteristic of God is relationship. That is how and who God is, and we are created in that image. It is our nature also, to be in relationship. This is the point I am starting at, where the sermon will go from here I have no idea but I better get on and write it! One of the hardest things for me in my walk with God is understanding when things happen which seem "out of the order". Like when that nice loving caring person gets an illness and the moaning complaining one has great health, when a child dies unexpectedly and before parents - the order is wrong. "For my thoughts are not your thoughts, neither are your ways my ways,” declares the Lord. We cannot physically comprehend all that God does and why He does things the way He does them. Yet often, we live in a frustrated state of asking God why and arguing with him about it. The truth is God loves us, more than we can actually comprehend and He has plans for us but that doesn't mean it's going to be easy. We all go through difficult times and sometimes life isn't fair but God never changes and His love for us is constant, the same yesterday, today and forever. I am in one of those times when I don't understand and when people are asking me questions and I don't have answers. 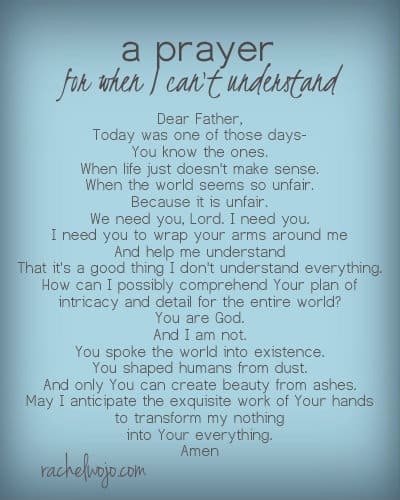 But I found the prayer below which I am sharing because it sums up what I am thinking and feeling at present. Lent is almost half way through now, it seems to be flying by! So how are you getting on with your chosen "fast"? I actually decided that this year I would take on a number of things rather than giving them up. You may ask why and I guess my response would be that for someone like me who lives a very busy life giving things up is easy but taking things on is much more of a challenge. I have to find the time from somewhere and have to stop and do it. So in the 40 days I am reading the Bible all the way through, though I have to use the Sundays as well or I can't really do it. I'm also doing something called 40 Acts where I am challenged each day to do something. So for instance today it was called BOGOF - the challenge to buy something where you were offered one free and give the free one away, or leave money behind the counter of a cafe to pay for peoples coffee. Sometimes it sounds so easy but finding the time to do it can be difficult, but my neighbours enjoyed some nice cakes today and have benefited from a number of the tasks, which has been great for opening conversations. Perhaps the one which I now know brought great joy to someone was to send a card by post, something I only do on birthdays and I'm beginning to do even that electronically. I sent a card to someone who has been a real encouragement to me for a number of years and just told her how important her support and prayers had been. A few days later I got a phone call saying how lovely it had been to get the card and how much it was appreciated. 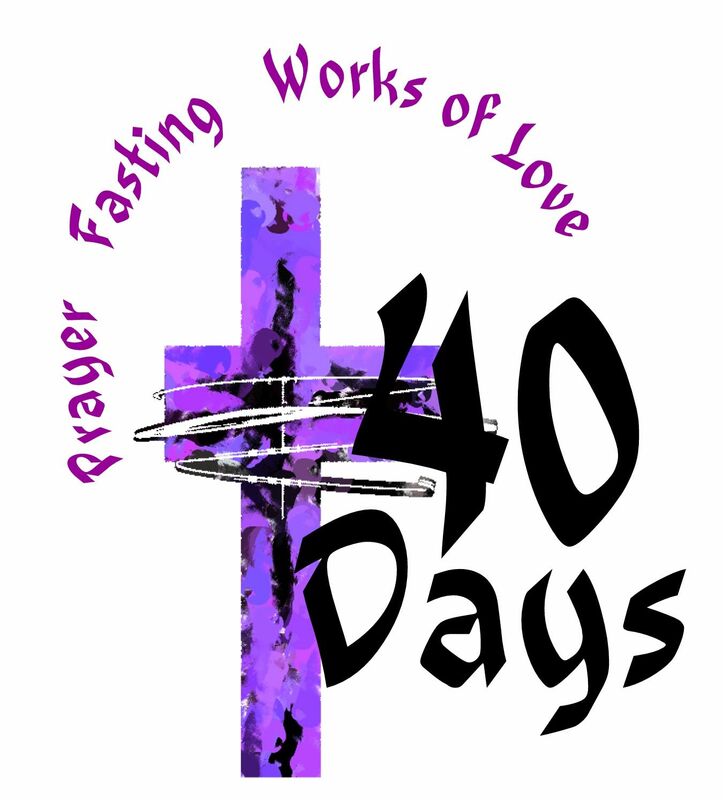 I have also started to think about what Lent is all about I know it is suppose to help us understand Jesus fasting for 40 days in the wilderness but I am not convinced it really does. It wasn't something Jesus commanded us to do as it wasn't instituted until AD360 and it was not about fasting but spiritual renewal for the preparation that Easter demanded. Then gradually its meaning has been changed and I suppose the very fact that I have taken things on reflects that. I am still looking at Lent and what it means for me but I pray that whatever you are doing that you will be blessed by God and be ready for Holy Week. I have been thinking a lot about peace over the last few days because of things people have said to me and situations I have encountered. I went to my dictionary and it talked about no more wars, when fighting ceases, and tranquillity of spirit. I think this is how the world sees peace but of course as Christians we experience the peace which God gives. There is a worldly peace we have when everything is going our way, but the peace God gives is a totally different quality of peace than that which the world gives. It’s a peace that passes our understanding; it makes us peaceful when all natural reasoning says we should be upset. I know it’s easy to say these things and sometimes so much harder to do them to allow God’s peace to reign in our hearts in these difficult times when we struggle to see God. I think it goes back to letting God’s word become a part of us, to not just be something which is in our head as mere knowledge, but in our hearts and a part of our being. I know that the journey from head to heart is probably one of the hardest but when we manage it there is real blessing. Do you have a Bucket List? The one below isn't mine but it's certainly got some good ideas in it! I started to think about it as I read the scriptures for this coming Sunday and thinking about what I would be saying. We celebrate the "Presentation of Christ in the Temple" or "Candlemas". As I was writing the sermon I began thinking about Simeon waiting for the Lord's Messiah to come, knowing that it would happen before he died. I'm guessing he was old and that for him this was the last thing on his Bucket List, but what a thing and far bigger and greater than Simeon would have imagined. It then took my thoughts to the film "Bucket List with Jack Nicholson and Morgan Freeman, two cancer sufferers who become the most unlikely of friends and end up spending three months together - each fulfilling a "bucket list". What they discover is that bucket lists have more to do with living fully and faithfully than dying. They end up discovering that what gives them the greatest joyare not the selfish, self-centred items but the things they took for granted like a meal with family or the love shared by friends. Nicholson's character learns the hard way through the death of his friend which makes him re-engage with his estranged daughter and sense the saving grace which flows from forgiveness. That thought is so very profound and is the basis of our own faith. We know the grace of forgiveness and the joy of faith. So am I saying we should have a "Bucket List"? Well I think that is up to you but I do wonder if we have one that we should take a leaf out of Simeon's and the first one on our list should be a "genuine hope to see Christ" and hopefully we would soon learn that can happen in so many different ways day by day when we genuinely look for Him. I’ve been thinking about faith and all that it means to me after a conversation with a student this week. I saw this quote from Martin Luther King, Jr. and realised how true it was. I thought of how I felt when I first had varifocal lenses and the difficulty I had with stairs but that I needed to take that first step or I would never get anywhere or conquer the stairs. Faith is something which is hard to explain but so important to have and my mission this week is to try and explain it in a more convincing way, with the help of the Holy Spirit, to my student. What does it mean to rejoice? I’m still praying through the verses from Philippians but it seems this week that there is not a lot to rejoice about with the various things that have been happening with friends and family. Then I wondered if I actually knew what “rejoice” meant. That didn’t really change the way I was feeling to be honest, I couldn’t feel any of those things about the situations that I had encountered the last week. Then I thought is there a difference between the word in an early and a spiritual way so started to do a bit of research. I found that there is a big difference between earthly happiness and spiritual joy. Earthly happiness is produced and maintained by events, by things, by experiences, often involving money and moods and materialism. Spiritual joy is a product of one’s good relationship with God through Christ and is constant. Earthly happiness fluctuates greatly as things happen or do not happen. You can be broke and in jail yet “rejoice in the Lord.” Paul did not enjoy good living conditions when he wrote these words in Philippians. He was in chains and a condemned man, but he had a constant joy because of his faith and he wanted all believers to have the same. This word “rejoice” cannot be understood properly if you equate it with earthly happiness. Earthly happiness depends on circumstances that change daily. This spiritual joy is a product of one’s faith in Christ, and this joy can endure changing earthly circumstances. It is that constant hopeful, peaceful, joyful state of mind – knowing that even when things here on earth are against you, God is for you – and you, by faith in Christ, are firmly attached to Him. I’m still finding it hard but at least I can look at it through slightly different glasses which I am hoping might help. Just before I went back to my “other” job, teaching at Ilfracombe Academy, I decided it might be a good time to revisit a book called “From Prison to Praise” by Merlin Carothers. Praying my verses the book came to mind and so I took it as a prompt from the Holy Spirit. I’d read it nearly 40 years ago when I first came to faith at university and a friend had suggested I might like it. It’s only small so I thought I would read it before I went back to school. It didn’t take me long as I remembered as I started to read it how “fast paced” it was. It is about Carothers faith journey and how he learnt the power of praising God in every situation. As I read it again it challenged me and made me think about what the book said and what the verses in Philippians 4:4-7 were saying to me. I confess I certainly haven’t got to the same point as him in praising God but I am finding on those occasions when I do, that I see little openings of light into what have seemed very dark situations, or just felt lifted and supported by God. I know it isn’t always easy in some of the situations we experience but taking small steps of faith is so important. I got those words on a card from a friend yesterday and they reminded me of part of the verses I am praying through this year. It has certainly challenged me about my own prayer life and my attitude to God in different ways. It is easy to give thanks when things are going well, but it gets harder when they get more difficult. Life isn’t just about the good times the reality is we go through a series of valleys and mountaintops. The good times give us the strength to cope with the hard times, well that is the theory but for me not always the reality. I try but being oh so human I often fail, sometimes quite dramatically. Recently I have been challenged by the blog of close friends who are going through those difficult times. Diagnosed with Stage 4 melanoma in October, no cure just palliative care. Then just after Christmas their eldest son collapsed and is in ICU in an induced comma with still no real diagnosis except his brain is swollen but with no real causes evident, it’s something of a mystery to the doctors. They have said some sort of brain disease not sure if it is treatable. As I have read the blog I have been inspired in my own life by the faith they have shown. Follow the link below I am sure you will find it a blessing and a challenge. I don’t make resolutions at the start of a New Year any more as like so many of us I know that they probably won’t last and I am only making them because it’s “what people do”. This year I have decided to take some verses of scripture and pray them each day. I have used them a number of times at PCC meetings and feel it’s time for me personally to pray them each day and see the result. I’ll let you know periodically how it’s going – and I share some of the things that happen.